Often, first-year Christopher Bibat will walk into the Hub and only see one meal option he can actually eat. With allergies to both gluten and dairy, Bibat sometimes struggles to find food that will fit his dietary restrictions, and on the days they don't have that one dish that works for him, Bibat notes that, "I can't eat anything." Living with allergies or dietary restrictions can pose a problem for many people. It can become a larger problem when someone has to move somewhere new and get used to a new diet. Life on a college campus can be particularly difficult for people with these restrictions. 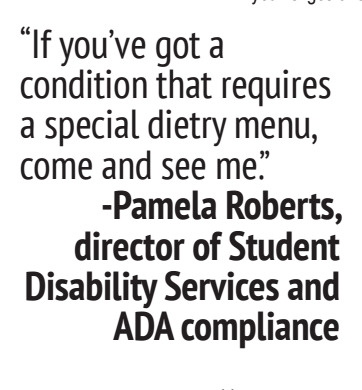 There are, however, many people willing to help with allergies and dietary restrictions at DePauw, for example Pamela Roberts, the head of student disabilities services. "Often times, students who have significant food allergies will come with medical information and specialized menus to say here are certain things that this student can eat, here are certain things this student cannot eat,” she said. After all the medical information is given, Roberts will help set up meetings with Jason Rose, the general manager of Bon Appetit, to help the student build their meal plan. Bon Appetit is working on providing healthy options for everyone, including those with dietary restrictions, and Roberts encourages students to make her their first stop on their journey to healthy eating. All of the people who work with food are more than willing to help students get the nutrient they want and need. 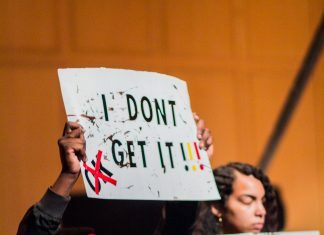 “If a student ever finds it difficult to find something to eat at any of our locations, I would recommend they schedule time to sit down with me to discuss some of the issues they may be experiencing,” Rose said. You can schedule appointment with both of them through email or by going to their offices. Roberts' email is pamelaroberts@depauw.edu and her office is located in the Student Union Building, room 220. Rose's email is jasonrose@depauw.edu and he can be found at his office in the Hub.